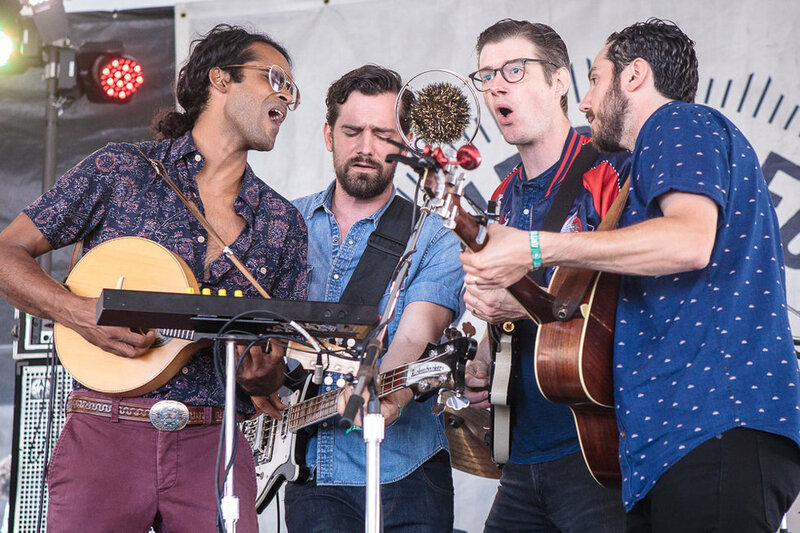 Our intrepid reporter caught Darlingside twice at Newport Folk Festival and chatted with the band about their new album and the touring life. Darlingside, who released their most recent record Extralife in February, are one of my favorite musical discoveries of 2018. The four members, Harris Paseltiner, David Senft, Auyon Mukharji, and Don Mitchell, unite gorgeous a capella harmonies over lush strings and synths (with occasional horn flourishes). Sounds like a great way to get people to hear songs about the end of the world. When I saw they were playing in San Francisco the same weekend I was visiting there this weekend I made sure to check them out (on the same night I got to see a fave discovery of 2017, the Aces). Since then, I've found myself immersing myself in their music regularly. 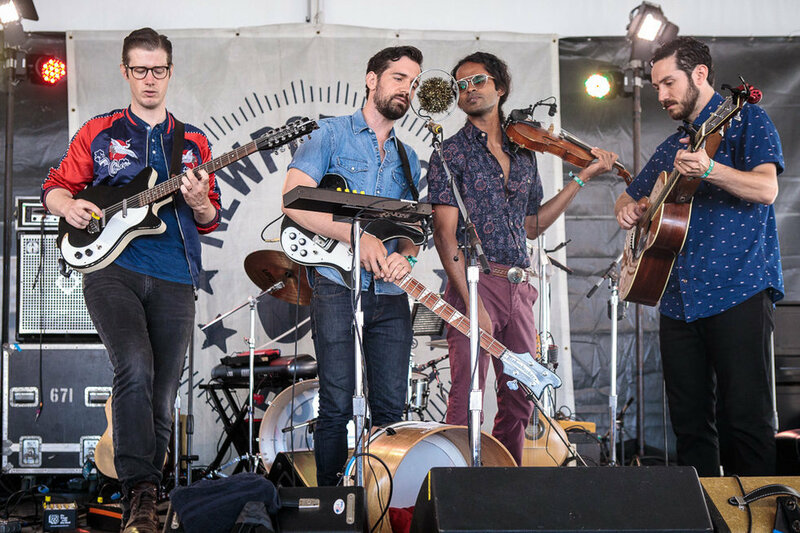 I only heard their Birds Say record after I saw them and I only realized they have another record (2012's Pilot Machines) from the bygone days when they had a drummer after seeing them at Newport Folk Festival this year. 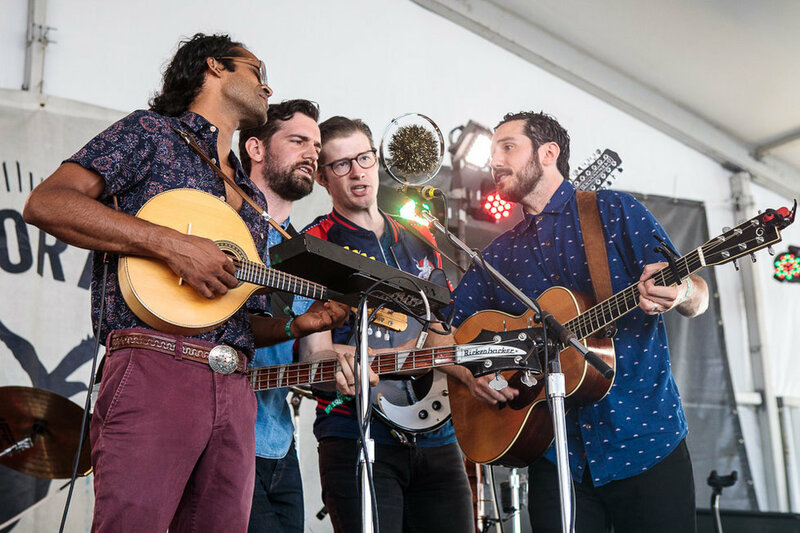 Their set at Newport was the first of the year on the Harbor Stage, and the band was playing to an audience that spilled past the tent's walls. NPR Music has a stream of their set (which you will find below). The second day, the same thing happened, but this time the group was playing the smaller Late July Family Tent, and they kicked things off there with a cover of the Smashing Pumpkins' "1979". Every time, I listen to their records or see them perform I take something new away from the experience. And after the brief interview, I did with them at Newport, I immediately had more questions for them. Like are there any easter eggs on Extralife that haven't been discovered or why did they move away from a proper drummer. Perhaps I'll get to another chance to ask them as I hope to see them again soon (tour dates). The interview has been edited and condensed for clarity. You guys share the same voice, in the musical sense. We witnessed that and hearing you live, it's such a unified voice. How did the band come together? Senft: When we met we were in college in an a cappella group. So our relationship began as friends and as singers. So, I think that speaks to a little bit of what you're talking about. Before we were a band, we were friends and we were only singing. We've been a band for nine years now, but we've been singing together for over a decade, closer to 14 years. We've had a lot of practice singing together, matching each other's voices. Some of it even comes down to things like when you have a consonant to say, maybe only one person says the consonant. It's not even something that we talk about much, it's just something that has evolved over that many years of singing together. That it's like, if we all say a "t", you get "t-t-t-t." But if one of us says a "t," then it kind of sounds like one voice. Little things like that that have just started ... we realized that we just started doing them without really even talking about it or thinking about it too much. So, it's really just come from a lot of time together. You put out your [third] record at the end of last year, Extralife. Does it have an overarching video game theme, or was that just slipped in as the title? Paseltiner: I wouldn't call it a full overarching theme, but we've turned to things around us that influence us, whether that's movies or books we're reading or memories of playing video games as a kid. That's part of our growing up experience, and a few of the songs that we were writing at least contain some references to either gaming or memories we have of playing those games as kids. "Extralife" showed up in one of those songs as a lyric and then ended up applying to themes across the record that extended well beyond video games. So, I'd say it started in a pretty literal referential place and moved to a more metaphorical space. Paseltiner: You just said it pretty well. I think, we in general, we don't have a dedicated traditional guitar-bass-drums setup that we build songs around. Instead we build them around the melodies and the lyrics that we're writing, and then oftentimes we'll think about the vocal arrangements and think about the voices first, and then the question comes in, "How do we want to build the setting for this song? Or how do we want to fill out the space around the core of the song?" We're pretty open to anything - any sound or anything that we can use to try to fill out the arrangement that we think best serves the lyrics of the song. For this record at least there were some sort of projections of the future and some dystopian lyrics that were cropping up between the four of us. Things like more of the Nintendo game sounds and the arpeggiators seemed to make sense. At the same time we are often using a palette of acoustic instruments, so it turned out that there are some songs that contain things like violin and cello and also a synthesizer. Then we tried to figure out what it was at the end, and we still don't know what to call it. Senft: I'd say a lot of the lyrics informed instrumental stuff, and then a lot of the instrumental stuff informed the lyrics and it came into focus in parallel that way. We didn't set out with a set of lyrics and then try to write music to that, and we didn't set out with music and write lyrics to that. They both are growing alongside each other -- we'll make some headway on one and then we'll go back and we'll make an advance in the lyrics. Then we'll go back and we'll look at the instrumentation and say, "Maybe this isn't right now," and then we'll change the instrumentation. Then we'll go back to the lyrics and say, "Now maybe this isn't right and we need to". We don't talk too much about any of it, we just kind of see where it goes. I think a lot of what the album ended up being is just an embodiment of some of the things we were feeling, and that made its way into the instruments and into the lyrics. Definitely, as you said, otherworldly. The otherworldliness, if it's there, comes from us looking at the world and not maybe recognizing it or seeing it as what we would like it to be, or looking at the future and looking at different possible futures and thinking about where things are headed. There's a sense of existential anxiety that pervades the album, and so I think that ... maybe you summed it up best by saying ... the otherworldliness is just from a little bit of dread and looking forward. There's a lot of that. Speaking about the instruments, as you guys started in an a capella group, did you know how to play instruments [on your records] at that point, as you were becoming a band you decided you needed instruments? Paseltiner: It's a mix of both. Some of us started playing, say, classical music at a young age, five or six years old, that kind of thing. Then others of us started picking up instruments later in life, say late high school or in college. When we did form the band we didn't have all of the pieces in place. For instance, Dave just bought a bass and started to learn how to play it 'cause we needed a bassist. Don found a banjo in the closet of the house he grew up in. At some point while we were writing music, he said, "I don't play banjo, but I'll try to figure this thing out 'cause it would be a nice texture." Same thing with the synthesizers that we used for the most recent record, where we said, "Well, none of us is a pianist," but if something serves the song, if we feel that it could help fill out the palette that we're trying to create, then we'll pick it up and learn it and try to fit it into the bigger picture. So, I'd say it's a mix of coming from a place where we have some training and also being totally willing to say let's create any sound we need to create to fill out the picture. One of my complaints, and it's hard to characterize it as such, is that your songs are short. They could actually be longer and they would just feel just as engaging. I want to hear more of them. Senft: You and my dad. He yells at me for that all the time. Paseltiner: Yeah, thank you. No, if anything we tend towards tighter forms. We're not great at improvising, and we, I think, are closer to the old school pop tradition of a song should clock in under three minutes, and then maybe we'll add on a little something. What has been one of your favorite touring experiences? Could be Newport. You kicked off this year's Fest with a great set but it could be any city that you liked or an audience that really reciprocated your energy? Senft: I think we've had a lot of them. Certainly a formative one was at the Sisters Folk Festival. That was one of the first times that we got to really stay in one place for a long time. A lot of people ask about our favorite places on the road, and it's sad that we have to usually say that we only see the inside of one building or you maybe get to spend a day off somewhere. It's just not often that you get to really immerse yourself in the local city or culture or whatever. Sisters, we got to be there for almost probably six days where there was a little song camp that happens before the festival that we got to be instructors at, and that's out by this volcanic crater lake. Then you go and play the festival and you're seeing all the same people that you were hanging out with at the camp, and that kind of immersive experience. Since then we've gotten more of that kind of thing. Newport, even just being here for two days and getting to hang backstage, has been amazing. Rocky Mountain Folks Fest has a similar camp. There's some other festivals that are like that, but our first time experiencing that and getting to hang out with other artists and really feel like part of a community somewhere that wasn't home was at Sisters. So that's always stayed with me as a very special place. As your main set was yesterday are you planning to do a secret set somewhere today? Paseltiner: That would be a secret. No. 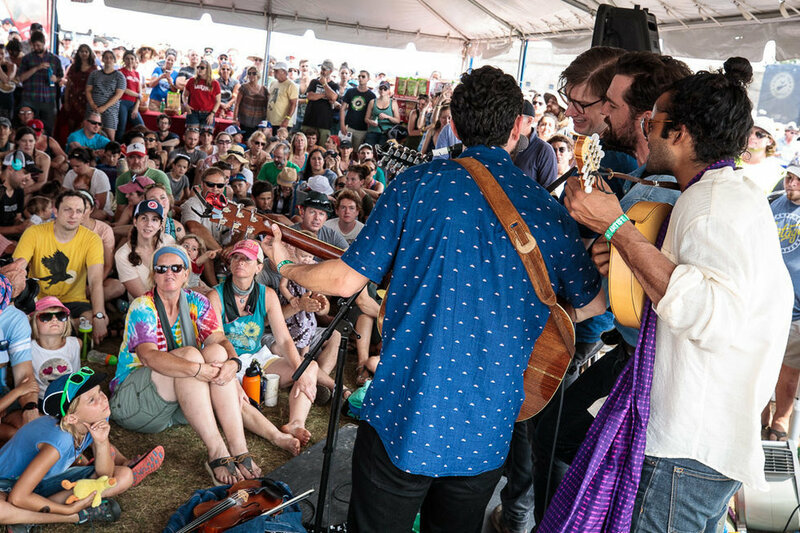 We're going to play an acoustic set over at the family tent that's out by the water, so we're looking forward to ... we'll pull out a few instruments and sing a couple.